Just a few days after I had made the pesto braided bread and patted my back 🙂 and Aparna of My Diverse Kitchen comes up with the August We Knead to Bake challenge…. a savoury filled bread and the bread had to be decorative. Couldn’t do the Russian Braid again so the earnest hunt began for a decorative bread. The first place I hunted was my book marked and saved recipes and lo behold came across rose buns to try from Fauzia’s Kitchen Fun. More than the filling what caught my eye was the shape. I searched for other decorative shapes but the rose rolls were stuck in my head. So one more bookmarked recipe or rather technique over and done with. I made a veggie filling as I am a vegetarian. Also my friend’s family is vegetarian. Yes, I met up with my best friend for lunch ( friendship day celebration) and also shared the rose rolls with her. I am glad that she exists in my life. My other best friends are my daughter and hubby dear. All three are my best friends in for three different reasons, one is a good listener, one gives sound advise and the other my best critic. Coming to the rose roll, when I was making them, I was pretty excited that I was trying out yet another technique to make bread look pretty and appealing. It was not difficult as such but next time I will have to make sure the ends are pinched and sealed well so that on baking they do not open up. I found putting the filling first and then making the cuts easier. You can use any filling…. savoury or sweet to make these rolls. I would suggest a sweeter dough for the sweet filling. The buns were soft even though I had not used an egg. Sift flour, milk powder and salt together. Add sugar and the yeast and mix well. Mix yogurt and water together. The liquid should be warm. Rub in the oil into the flour. Add the yogurt mixture to the flour and form into a dough. Knead the dough well for 10 to 15 minutes using the heel of your hand till it is soft, smooth and silky. Grease a bowl with oil. Form the dough into a ball. Rub oil all over it. Put the dough in the bowl, cover with a cling film and let it rise till its double the size. This will take about 1½ – 2 hours. When it is a bit hot add cumin seeds. Add the chopped onion and garlic. Stir fry for a minute or 2. Add asafoetida, ginger and chilli. Add chopped potato,carrot, turmeric powder and salt. Mix well. Add water, cover the pan and let the vegetables cook over low heat. Take the pan off the heat. Add coriander powder, lemon juice, pepper powder, corn and sugar. Mix well. Leave it open to cool. When the mixture is cold, add cheese and fresh coriander. Knead down the risen dough gently. Divide it into 12 parts. Each part is about the size of a golf ball. Roll the parts into balls. Using a bit of flour roll one part into a circle about 4 inches in diameter. Take about a pinch of butter and rub it over the circle. Put about 1½ – 2 tsp of the filling in the middle of the circle. Make 4 slits (north, east, west, south) ⅓ of the way. Pick up one part of the flap part and wrap it around the filling. Take the opposite flap and wrap it around. Take the third part and wrap it around. Repeat with the last remaining flap. Pinch the ends into the dough and seal well. Using your hands, try and round off the shape. Place the shaped dough on the greased tray. Repeat steps 4 to 13 with the remaining dough. Bake the rolls for 15 to 20 minutes or till the buns are done and golden brown on top. Remove the buns from the tray and place on a wire rack to cool. Serve with soup, salad or have it on its own as a snack. Serve with your favourite chutney or sauce. Instead of yogurt you can use 1 egg. Make a filling of your choice, spinach, cheese, paneer, nuts, dry fruits etc. Next time when I make the rolls I will seal the ends with a bit of milk. As you can see from the pictures, the ends opened up on baking. If you have filling left over, use it to stuff a paratha or make a sandwich. By the time you make all the roses and the oven reaches the required temperature, the buns will have risen again. You don’t want them to rise too much as the shape will fall apart. Use butter sparingly. Too much butter will result in the flaps opening up. Rose rolls look too cute.. And with the filling its just yumm…I have made them with non veg filling yet to post it..
Thise rose rolls looks damn cute, i have baked the same one few months back. 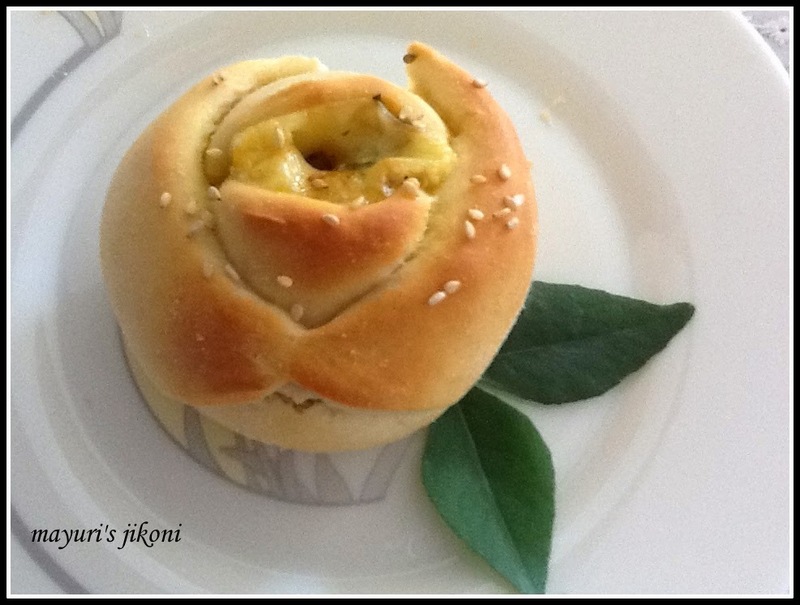 pretty rose rolls… I don't have oven.. :'( how to make on stove top..?